The Muslim Students' Society of Nigeria, Lagos State Area Unit has warned President Muhammad Buhari not to consider or attempt any ban on Hijab. The Amir (President) of MSSN LSAU, Mallam Saheed Ashafa, said this at the ongoing December Islamic Vacation Course holding at Epe, Lagos on Wednesday. He said that such consideration would ridicule the war against Boko Haram, adding it was an unnecessary approach. According to Ashafa, ban on Hijab means that Boko Haram has succeeded in their deceptive ideology and may strengthen their unjustifiable zeal to kill innocent souls. It would be recalled that President Buhari during a presidential chat late Wednesday said the FG may consider ban on Hijab if terrorists continue to use it to perpetuate evil. But Ashafa condemned the insight saying that such showed that the FG was still considering some unrealistic approach in the fight against terrorism in Nigeria. He added, "The statement by President Buhari is disappointing. It is an indication that the present administration is trying to apply the faulty approach of the last administration that took us nowhere. 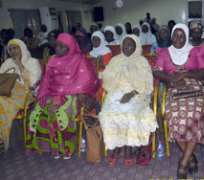 ‎ Ban on Hijab is wrong, biased and the greatest approach that can drown the support and popularity of the Buhari-government. "‎The decision to ban Hijab may mean that Boko Haram has succeeded in their mission. Rather than ban Hijab, the government can acquire bomb detective gadgets which can detect bombs from afar. Instead of considering how to stop the wearing of Hijab, the FG should be thinking of how to stop Boko Haram. "If Hijab ban must be considered, then the government has to also ban use of vehicles, hand bags, cell phones, motocycle and suits because more evils have been perpetuated through them. It's totally illogical to attach Boko Haram attacks to a dress code or pattern. Our Hijab is a garment of honour; it is an apparel of modesty and an outfit commanded to be worn by Allah." Ashafa, however, condemned Boko Haram and its activities in entirety, but insisted that more practical approaches were needed to defeat the terrorists. He subsequently commended reports that soldiers are emerging victorious in most of their face-off with the terrorists. The student-leader clarified that it was wrong for the President to play ‎on the intelligence of Muslims, saying, "It is known to everyone that Hijab is worn by Muslims and a ban on the religious garment is an attack on Islam. "Just as it would be wrong for anyone to say that suits or vehicles should be banned because they are used to rob or assassinate and terrorise; it would also be unfair for anybody to consider Hijab ban because of its wrong usage."